Engineers Marine Design Center who cooperated with the Panama Canal Commission on this project. trade-off studies of various possible methods. HERCULES to lift the pendulum was carefully checked using detailed AutoCAD® drawings. back into service to assist with the maintenance of the Panama Canal. 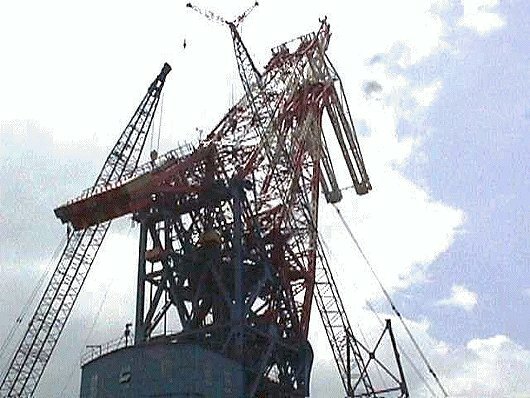 The successful re-assembly of the Titan crane was featured in the December 1998 issue of the Panama Canal magazine "Spillway". Photograph courtesy of Panama Canal Commission. Check suitability of the Panama Canal’s assisting floating cranes HERCULES and GOLIATH.